Swallow Hard: The Lancaster Dinner Service was a museum intervention for the Judges Lodgings Lancaster and part of a two year collaboration with Lancashire Museums Service. The project was managed by Susan Ashworth (Lancashire Museums) and Susan Walsh (UCLAN). 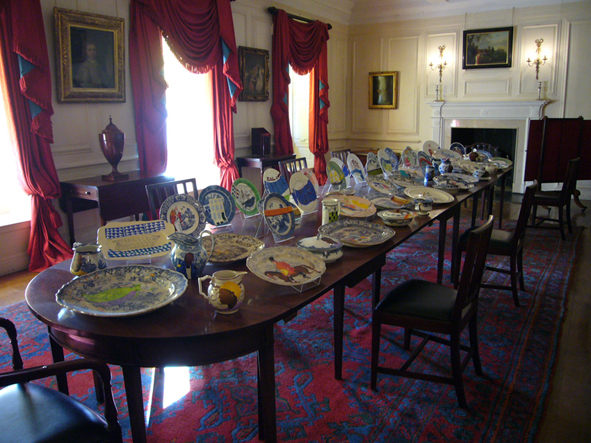 During the summer of 2007 as part of a larger project ABOLISHED initiated by STAMP and the Museums Service, Lubaina Himid staged a display of painted ceramic “cartoons for the dining room and kitchen of the museum, to commemorate the 200th anniversary of the Act of Parliament abolishing the slave trade in Britain. Professor Himid conducted several guided tours and gave a number of illustrated lectures to local audiences interested in the history of the visual representation of Black people in European art. Visiting academics from the USA, the Caribbean and continental Europe as well as groups of young people from across Lancashire, who wished to learn more about the museum and its collection, were encouraged to discuss issues around the slave trade in Lancaster and its impact on the wealth and architecture of the city. Swallow Hard : The Lancaster Dinner Service is an intervention, a mapping and an excavation. It is a fragile monument to an invisible engine working for nothing in an amazingly greedy machine. It remembers slave servants, sugary food, mahogany furniture, greedy families,tobacco and cotton fabrics but then mixes them with British wild flowers, elegant architecture and African patterns. I bought 100 patterned plates, jugs and tureens mostly old and used, sometimes chipped and cracked, sometimes ornate but rarely plain, from the shops and markets of Lancaster, Preston and Whitehaven. The buying and the painting took place in the same time frame so the Dinner Service grew organically. For instance I might buy six items, paint them, then buy three items, leave them until I had bought four more items, then paint them until all were complete before buying more. The prices paid vary hugely; some were almost given away and some are very valuable, all are overpainted with acrylic paint. There are views of the city, plants that always grew here, there are maps, slave ship designs and texts from sales of these ships which took place in the pubs and hotels. I have painted pages from account books, elegant houses, patterns from Mali from Nigeria , from Ghana and all along the West African coast, these patterns like the paintings of buildings and vistas, boats and documents all cut across or weave in and out of the original patterns found on the old ceramics. 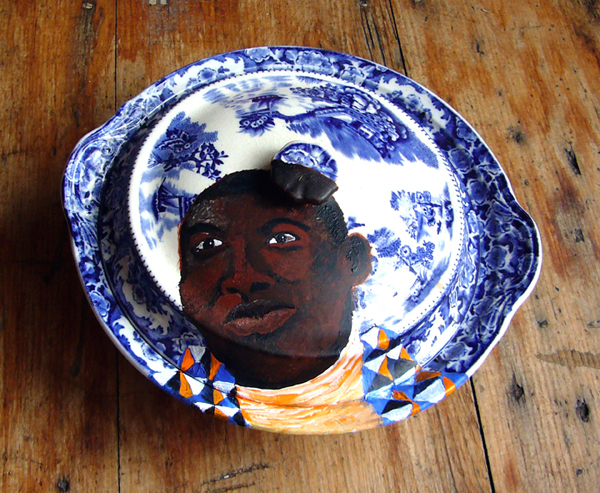 On every tureen the faces of the unknown and unnamed black slave servants ask to be remembered. On every item its possible to see large areas of the original design as the new painting emerges or unsuccessfully attempts to hide the identity of the old. Overpainting has become central to my work at the moment. In the past I have painted over maps, museum postcards and pages from magazines. Now I am often tempted to paint new paintings on top of my old work, much to the dismay of curators and friends, but the idea of leaving parts of an old painting exposed and covering other parts really intrigues me. Several paintings in the exhibition Swallow (2006) at the Judges Lodgings were examples of this overpainting. It could be that the past needs to be partially obliterated or perhaps its just that there is something very exciting about watching something familiar disappear for ever. This drastic action then gives me an opportunity to challenge myself to making a better piece, the chance to tell a new story while still being able to hear the echoes of the old one. Shown at the Judge’s Lodgings Museum on the splendid 18th century dining table, made by the Lancaster firm of Gillows, from imported Caribbean mahogany. The Customs House on St Georges Quay was designed by Richard Gillow and there are records to show that he at one time had part share in ships used for the slave trade. The installation attempts to map a visual history of the city’s involvement in the trade and to commemorate the Act of Parliament abolishing it in Britain in 1807. Slaves could still be owned of course but not traded for goods. Commissioned by Susan Ashworth, Project Manager Lancashire Museums, this work has been in production for 2 years. The research and development stage was spent walking the hundreds of streets, Queen street, St Georges Quay, Castle Park and Chapel street are just four important ones. I read the maps, photographed the buildings; the Customs House, the Quaker Meeting House, the churches, the Town Hall and the Sun Hotel and many more. I looked hard and filmed the wild plants and the water, the bridges, the walls, the minute details and the vistas. All this led to the production of numerous paintings and drawings, some shown as Swallow at the Judge’s Lodgings in 2006. Since then I have looked at documents, ship designs, prints, watercolours, more details and more splendid doorways. These led into the houses of Lancaster slave ship owners such as Dodshon Foster, William Lindow and John Satterthwaite. I have tried to imagine the lives of the almost invisible slave servants these men owned, brought from the plantations to work in quiet isolation in this chilly place. I looked for clues, connections, ghosts and heroes. This Dinner Service will sit as if it has always been there, on the tables, the mantelpieces, the sideboards and the window sills of the Judge’s Lodgings telling the story of lost languages, the intense activity of commerce, the creative energy of influential traders and the alien looking structure of British wild flowers. Hopefully the intervention will in turn help to explain what makes Lancaster the complicated place it is. It is a city in which traders became Abolitionists and in which Quakers owned slave ships. There are beautiful buildings designed by men involved in horrible deeds. Behind doors in attics and underground are the hidden histories of a few almost invisible African people who were owned by families engaged in a legitimate but immoral strategy to make a lot of money fast. Inside the tureens and the jugs are the names of the people painted on the outside; a hidden but very real identity. This work is not a memorial but more an encouraging incentive for everyone committed to restoring the balance, revealing the truths and continuing the dialogues.